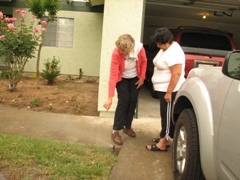 City water conservation specialist Marilyn Creel shows Fresno resident Mary Ann Evans how to adjust her sprinklers to point them away from the sidewalk. Monday on The California Report, Central Valley Bureau Chief Sasha Khokha tracks one city’s longstanding rebellion against water meters–and says the day of reckoning is nearly at hand. Listen to Sasha’s story here. I admit it. I wanted to do this story because I saw so many of my neighbors watering their driveways. What I learned is that unmetered cities are a long and slow-dying tradition in the Central Valley. State lawmakers overrode Fresno’s rule, because they understood that cities with meters use less water. 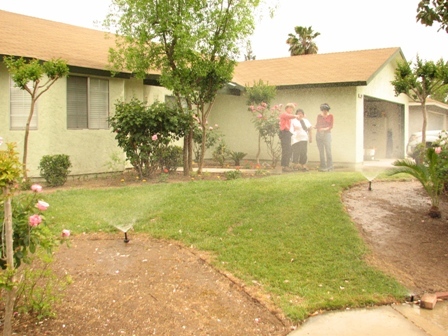 Ellen Hanak, a water researcher with the Public Policy Institute of California, has found that metered cities use about 15 percent less water than unmetered cities. And cities with a tiered rate system save an additional ten percent on top of that. In addition to usage, her report compares different cities’ water rates. Of course, San Franciscans get away with using less water because–guess what? Many of them don’t have front yards. But meters are coming, one way or another. There are basically three laws that will eventually require the entire state to install water meters. One says that all homes built after 1992 must have meters. Another dictates that cities that get federal water (like Fresno) have to install meters by 2013. And yet another law says that all California cities (including holdouts like Sacramento) have to be metered by 2025. Fresno is gearing up to install its first meters this year. They’ve even created a handy Q&A for skittish customers. And if you thought Central California was the only laggard, this might make you feel better: many Chicago residents don’t have meters, either. But they probably don’t have the sprinkler ladies–who can fix any leaky, squeaky, spritzy sprinkler, and make sure it’s pointing away from the sidewalk. KQED’s Sasha Khokha braves sprinkler spray to record Fresno’s city water conservation team at work. The lack of metering in towns like Fresno has major operational issues as well – it makes it all the more difficult to detect leaks. Even water utiltities that meter can loose 20% of the system’s water to leaks – and without good meters you’d never know where the water is going. Good point and we’ll be addressing that in an upcoming story by Gretchen Weber, in which we follow her on her personal quest to cut her water use by 20%. But the leak issue probably deserves a whole story devoted to it. I’d love to see some reporting on the typical city’s lost and unaccounted for rates. It’s very hypocrtical of cities to request conservation when their delivery systems loose as much as 20% of the water that comes into it. Water is often lost via leaks in underground pipes (contributing to pot holes) or via inaccurate water meters. The city passes on the costs from water they loose into your water rates. If we’d been stricter with how cities could recover this lost revenue cities would have had incentive to replace pipes before they rotted away. Our infastructure would have been far better off.